Guess what time it is almost again? Hispanic Heritage Month! 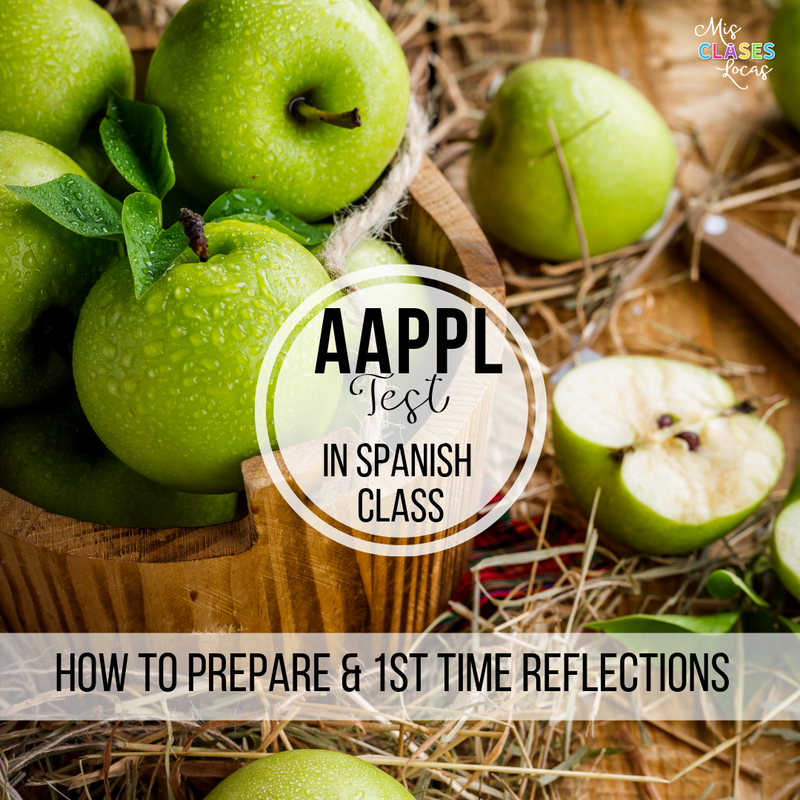 Two years ago I realized as a Spanish teacher, I need to do a better job using this month to celebrate the diverse cultures of the Spanish speaking world. I did a post with a lot of ideas for HHM here Lista lunes: Hispanic Heritage Month, but was on maternity leave the entirety of September 15-October 15. 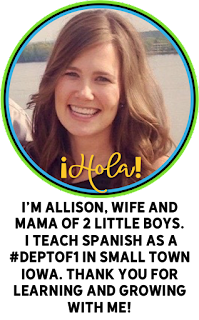 I also created a popular resource, 1 Song from each Spanish speaking country. It has 22 songs, one for each of the school days from September 15-October 15. By request, I created another version with 22 MORE songs in 2017, 1 from each country & then version #3 for 2018. You can now also get all 3 sets for a deal. How do you pick which version to use? Well all of them have a mix of classic songs and current hits, but the newest version #3 has the most up to date music. You do not need to do them in any kind of order and can start this year for the first time with version #3 if you would like. Here are ideas of how you can use these songs this year, from least time commitment to the most. 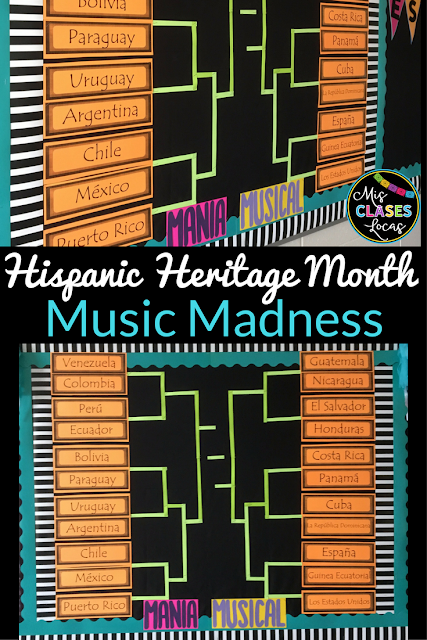 Use the first 3-5 minutes of each class during HHM to play a song. You can quickly mention where the song is from, using a map to show where in the world it is. Depending on the level, you can also evaluate the song, from a basic "(no)me gusta" in level 1, to more elaborate critique in upper levels. Using Martina Bex's Cantaninja procedure, you can have a student pick when during each class the song is played. They yell Cantaninja! and everyone stops what they are doing to watch the song of the day. (Usually that person picks the song, but during this month you could just play the next song). If you would rather have more control of when your brain break is, just plan to play this song at a good breaking point. If using it as a brain break, I would let students walk around, dance and move, just as long as they are watching and listening. 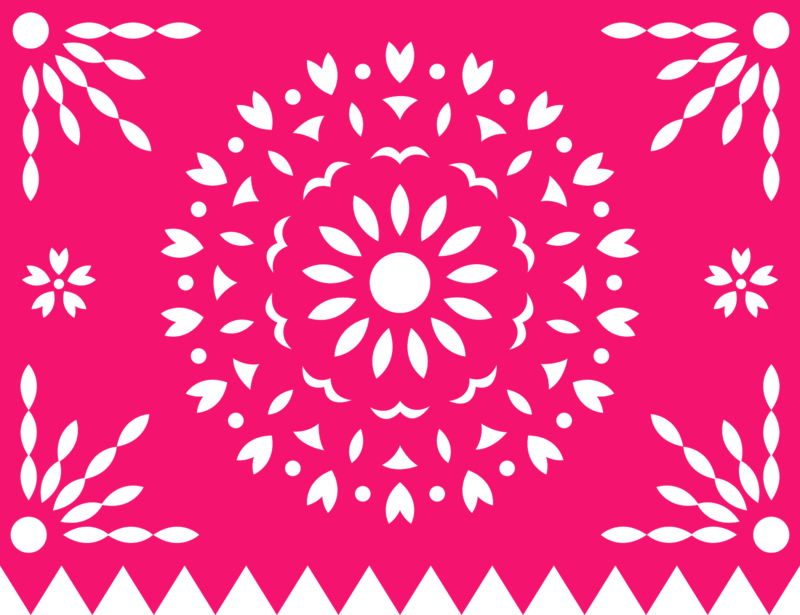 If you have more time to dedicate to Hispanic Heritage Month, you could go even deeper. You could split up the artists/group of each song, and have students do some research on the song, artist, country etc. These could be shared around the room gallery walk style, or even in the hall or somewhere in the school, to help celebrate Hispanic Heritage Month school wide. This idea was from the awesome Sarah Whisenhunt. When she got version 2, she told me she had a head to head playoff/bracket in mind for version 2 songs vs. version 1 songs. This could be done very similar to the popular March Madness Music Bracket. If you have the time you could show two songs per day, and then have the class vote. If not, it could be homework each day to listen to the 2 songs and vote using a Google form with the links included. After the original 22 days, you could keep voting as a class, or just assign it as a day activity (or even sub activity for fall state language conferences), where students listen to the songs and complete their own personal bracket. If you plan to do a bracket with both slideshows, I just added a simple bracket to both slideshow resources to try and organize it. Since it is not a nice number like 16 or 32, there are are some in a play in round and I only included 20. (Symmetry is important to me;). In the bracket, there is a link to an editable Google Sheet, so you can adapt and change it as you would like. Also, if you already have the slideshows and want to do a bracket, go to my purchases and download the newest versions. That way all the songs line up in the same order. Since I was gone during HHM in 2016 on maternity leave in 2017 I decided to do a bracket, but for the sake of time only using slideshow version 2. Once again the lack symmetry got the best of me with 22 songs competing. No, it is not an even match for every song. Yes, my board looks like packman. No, I did not allow enough space for this board and everything is crunched. To be efficient, instead of putting all of the song titles like I do during March madness, I just reused Spanish speaking country signs that I already had in my filing cabinet (yeah hoarding!) that I am pretty sure came from this unit. I hope it will put more of an emphasis on the songs' related country. The plan is to watch a pair of videos per day, and have all classes votes combined to decide who will move on. Depending on the class and what we are doing that day we may watch at the start or class, as a brain break, or at the end as a reward. We will either vote on Google forms, or old school with tally on the board. We will start September 15 and using just one slideshow, there are 20 match ups, perfect to finish before quarter 2 when my exploratory group ends. Here is my updated bracket for 2018. I got new country posters for free from Miss Maestra Cassie here. I am using one song from each country version #3 starting on Monday, September 17th. Each day we will listen to one pair of songs and all classes will vote together to see who moves on. Depending on the day we may start class or wait and use it as a brain break. We shall see who wins! 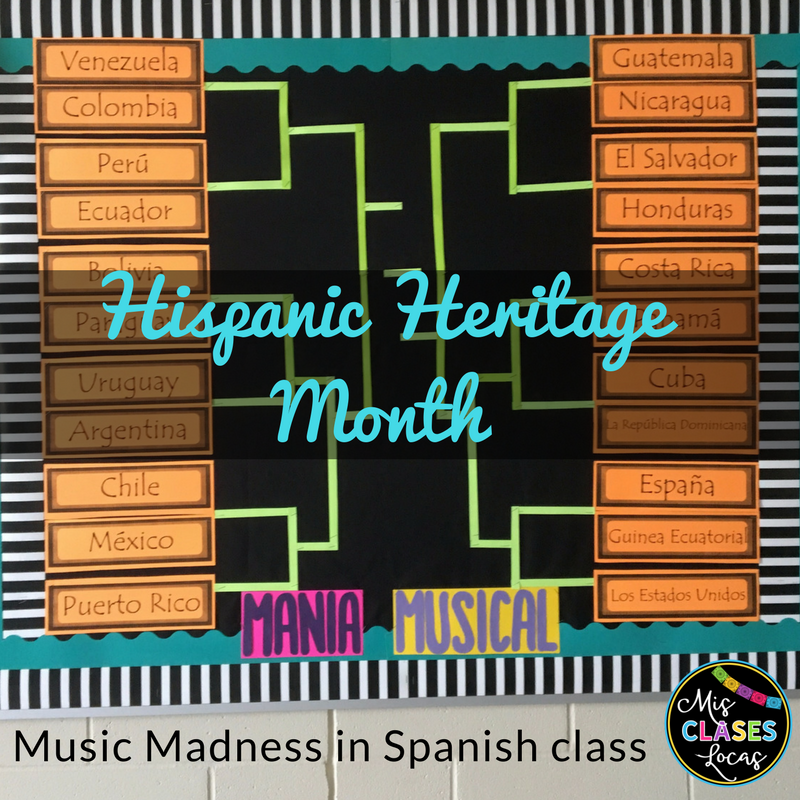 Sra Penaranda created a student handout for students to fill out about each song. You can get it here for free. Hopefully this will be a fun way to spice up the fall! What are your plans for Hispanic Heritage Month? If you use a bracket, please share pictures and tag me on social media! Remember you can also get all 3 sets here! 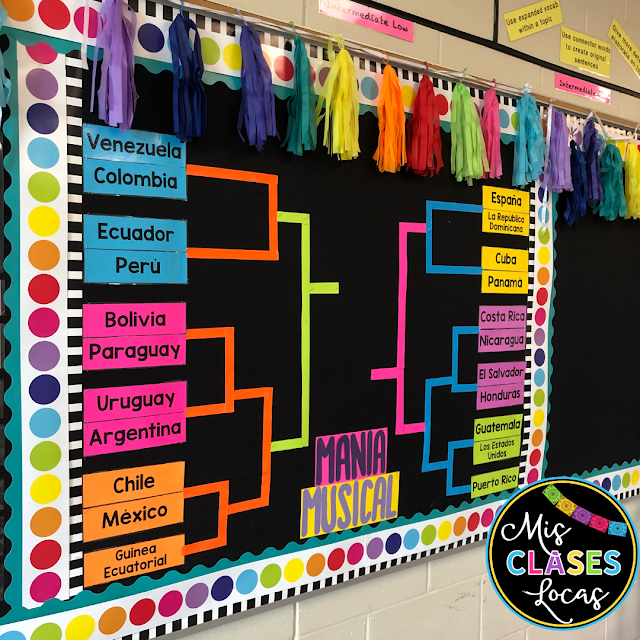 This post was originally published on 9.6.17 by Mis Clases Locas and was updated on 9.9.18. Do you have the students complete any type of activity while they watch the music videos? We just watch them for fun and discuss them. You can always add something if you want to! What do you do on your board once you have a winner between two countries? Do you move the winning countries to the right? or do you pin down a copy of the country? or do you write it down? I'm just wondering about the placement and keeping track of what country wins each day. Thanks! It's SraPenaranda. I created the activity sheet for the Mania Musical. I don't know how to share the file. I have a PDF. Any advice? I have on my TPT too.